It’s a summer’s night at Countesswells in Aberdeen but there is no thought of holidays or half-hearted training among the Gordonians players as they gear up for the new rugby union season. Instead, with head coach Ryan Morrice propelling his charges forward, there is a real sense of purpose and ambition about the National League 3 organisation in tackling the challenges facing the sport in the north-east. Some clubs are struggling with declining numbers, while others are facing issues off the pitch. These days, persuading youngsters to get interested in team pursuits can often resemble climbing Everest with a piano on your back. But Morrice has a long-term vision and says it is vital for “clubs in Aberdeen to start working together and stop focusing on just what’s good for themselves”. This redoubtable fellow does not waste time on blaming others. The opposite, in fact. And his message demonstrates that Morrice’s ambitions are far from minor. He said: “We set up the Pelicans a couple of seasons ago, starting with age groups P1 and P2, then adding P3 last year, and we’ll have a P4 this season. “Alan McLean and Bob Fraser have put a tremendous amount of work into this. Other clubs, such as Aberdeen Wanderers, Deeside and Ellon, have brilliant set-ups and coaches, so the young players are there to be engaged by the sport. “The bigger challenge is keeping them in the sport. But clubs need to be proactive to the ever-changing situations. Morrice has clear ideas on what he would like to see happen in the Granite City. It involves greater co-operation between not just different organisations, but different sports. As he added: “It would be great if facilities such as Kingsford and the new facilities at Cove Rangers were available for use by sports other than football. From a business point of view, I would have thought it would generate income and publicity for the owners. “But as far as rugby is concerned, clubs have to start working together and stop focusing on what is just good for them and rather focus on what is good for the sport in the city with an emphasis on progression and a pathway for players to play at as high a level as possible. “There isn’t much point in a pathway if it only benefits one club. 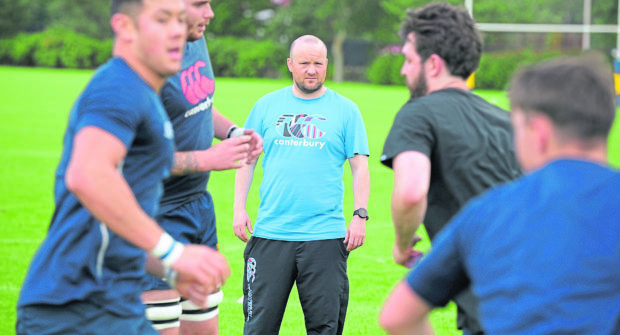 “This will take a lot of work and concessions will have to be made by clubs and individuals, but Dundee High have started something along a similar line with Morgan RFC and Abertay University. “As a city, Aberdeen has two universities, a private school, two teams in the National League, a team in Caledonia 1 and teams throughout the other Caledonia divisions. Morrice recognises there is a lack of suitable indoor amenities in winter. Gordonians, for instance, have found the only slot they can get at the Aberdeen Sports Village is 9.30pm to 10.30pm on a Thursday. Yet, he isn’t remotely defeatist. He said: “We are lucky that RGC has an outstanding facility that we are allowed to use for training and home games. Accentuating the positive isn’t always evident among Aberdeen’s sporting community. But it’s at the core of Morrice’s philosophy.